There’s a first time for everything, even for Disney fanatical families. Would you believe that this was our FIRST time ever attending Mickey’s Not So Scary? SCREECH – cue record player scratch. That’s right; not one member of our family has ever attended. And you bet, we soaked in ALL of the moments to give you the 13 Best Family Tips for Mickey’s Not So Scary Halloween Party (did you see what I did with the un-lucky number 13 there?). 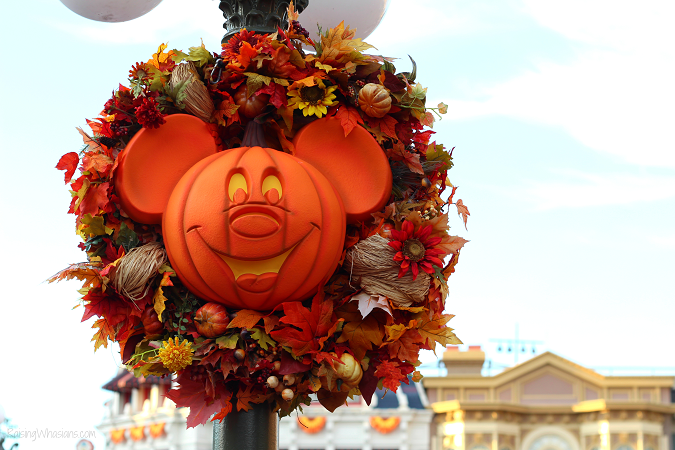 So whether it’s your first time or 50th time, I have the ultimate list of best MNSSHP tips for 2016 – from costumes to parent secrets, air conditioned candy stops to allergy-friendly offers, open rides to best one-of-a-kind Walt Disney World experiences. 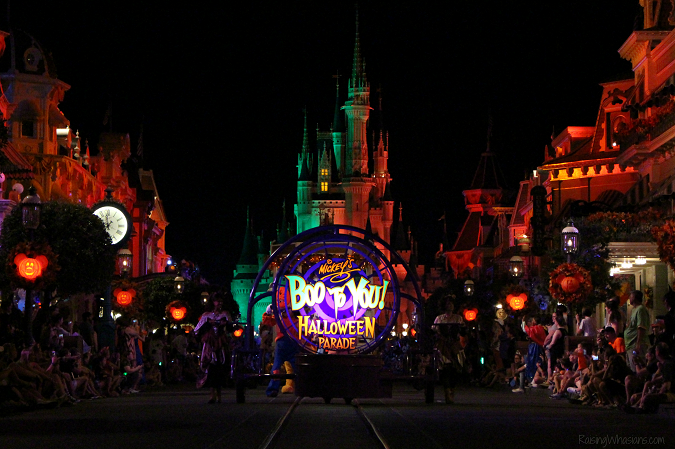 Make the most of your Walt Disney World visit this Halloween! Let me disclaimer this statement. 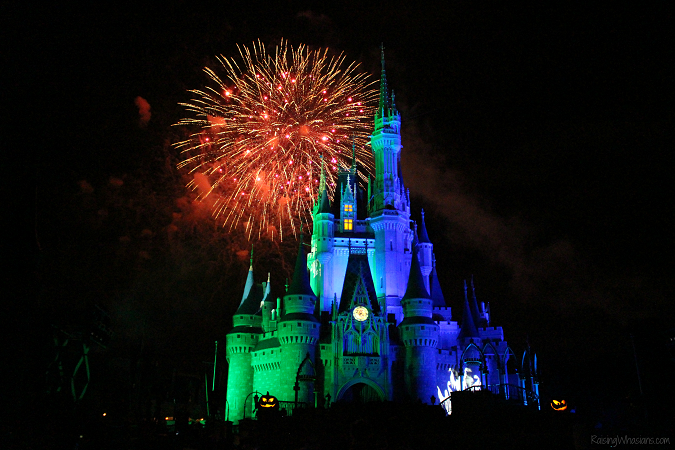 The official starting time of Mickey’s Not So Scary Halloween Party (or MNSSHP for the rest of this post) is 7 pm. However, ticketed guests have been able to get in as early as 4 pm the night of the party. This is a bit of a risk – especially if cast members aren’t set up yet to accept guests. So you may be waiting until 5-6 pm to get in. But if you’re a family with little ones (like me), I think it’s worth the risk. You avoid the big crowds getting in, giving you a more relaxed entrance into the park. And best part, you hopefully get a few extra hours to enjoy Walt Disney World with your family – during daylight. Grab your pictures, ride the rides (especially the ones that will be closed early), and soak in the festive fall decor before the sun goes down. Forgot your goodie bag? Don’t worry, Disney World provides! 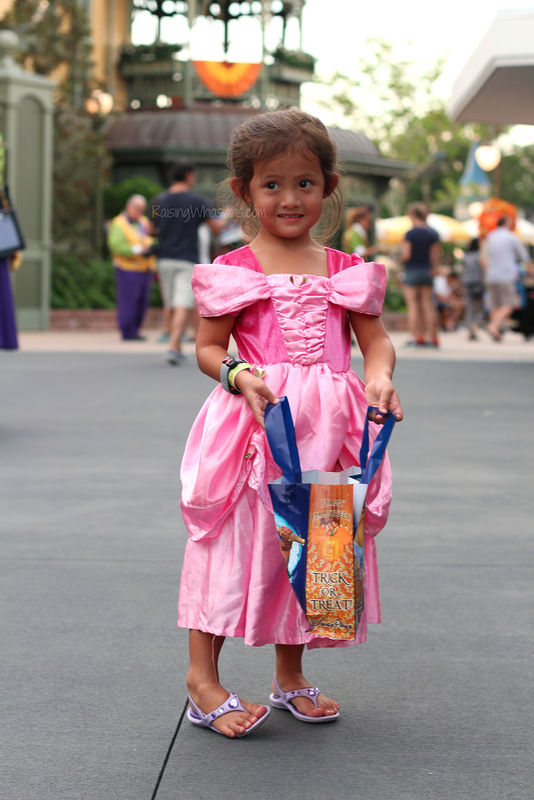 Everyone will get a sturdy plastic Disney tote for your candy – this year is a cute Beauty & the Beast and Moana print. Costumes are fun for kids – for the first 5 minutes. Best tip – take those memorable pictures EARLY. Then have those extra comfy outfits handy (pajamas are a GREAT idea) in case your kids want to change clothes. Especially with the hot Florida weather (yes, even in October), you’ll be grateful to have extra clothes ready. 47 lbs. of dead weight, carried for 5 miles to your car. Doesn’t sound fun, does it. By the time midnight rolls around, there aren’t many Trick-or-Treaters left awake. If your kids can still “fit” in a stroller, bring one. Pushing a sleepy kid is much easier than carrying one. Trust me! It’s still HOT in Florida in October, some nights still over 80 degrees. 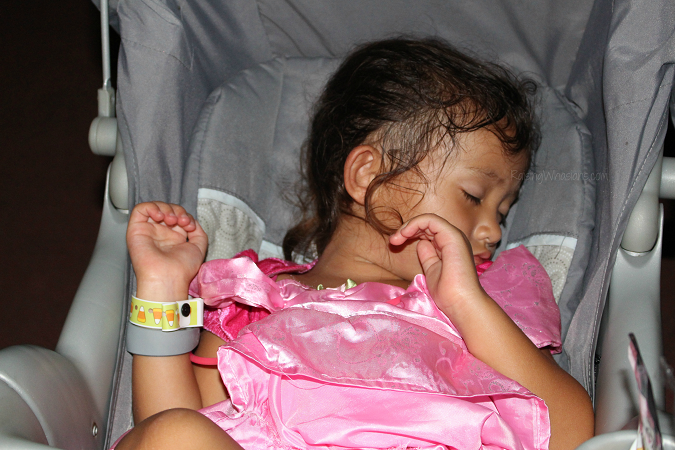 Add costumes, accessories and heavy bags of candy – your kids can become quickly dehydrated. Have LOTS of drinks on hand for your kids so they don’t miss the fun! Love to play Sorcerers of the Magic Kingdom? 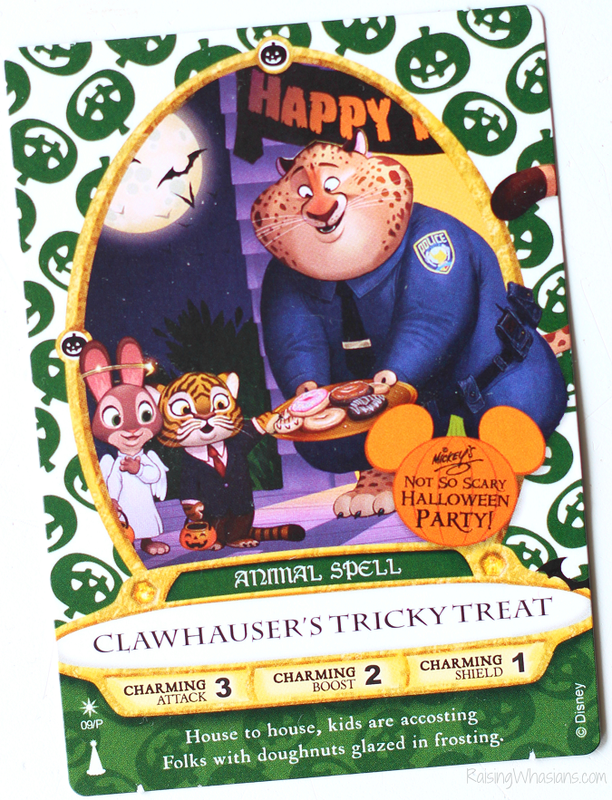 During MNSSHP, you can get a limited-edition exclusive spell card. This year is the year of Clawhauser’s Tricky Treat. We also were able to score the limited-edition Olaf’s Snowgies card from last Christmas too, thanks to some helpful cast members! Other specialty food and merchandise will be available throughout Magic Kingdom as well. 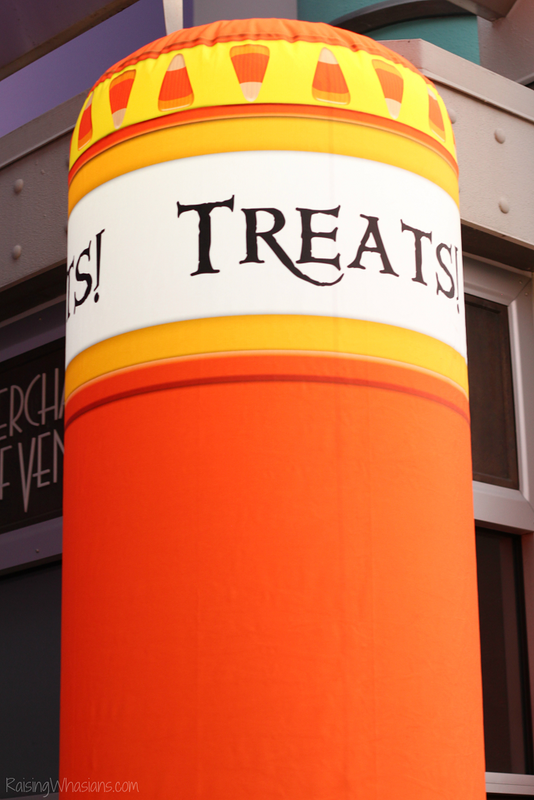 Look for special T-shirts, Magicbands, Pins, and treats for sale. 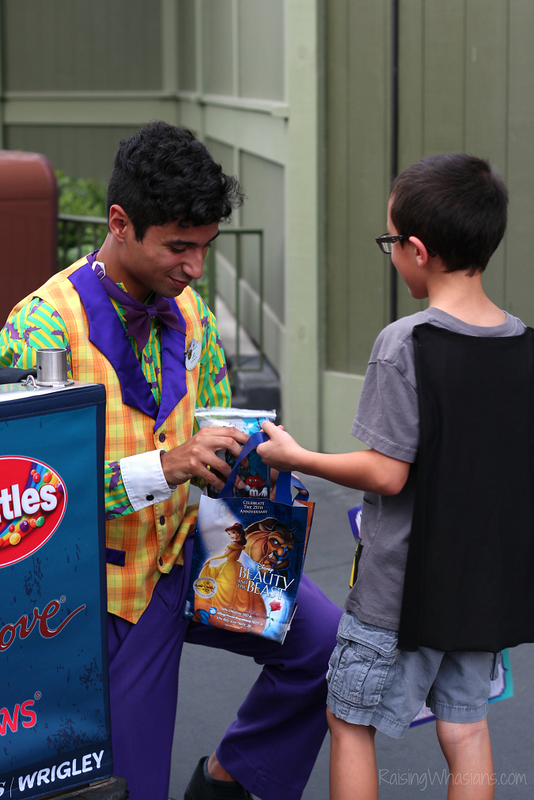 There are officially 13 candy stops + 2 allergy-friendly candy centers for the 2016 MNNSHP. 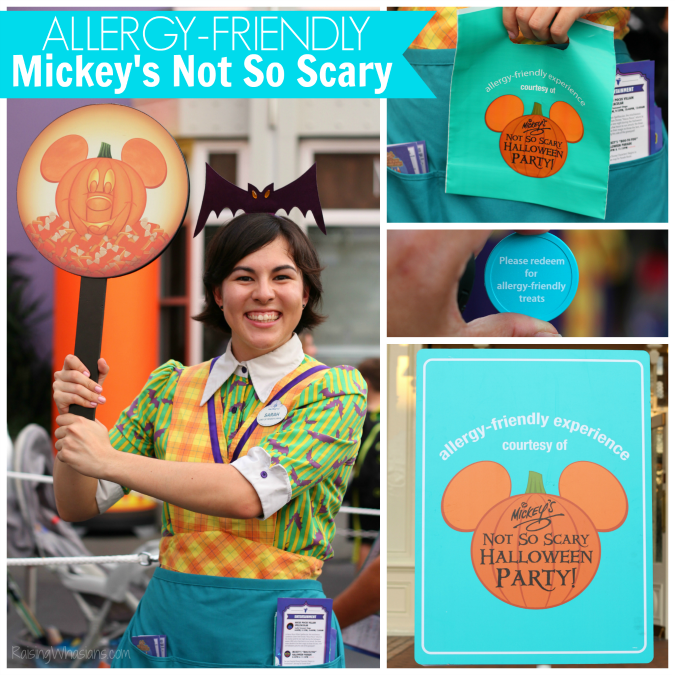 My friend Shelley over at On the Go in the MCO made an amazing Mickey’s Not So Scary Allergy-Friendly Guide – with everything your family needs to know about this year’s allergy-friendly tips and offerings. My favorite place to catch this parade is right at the end of main street (by the exit). You get the castle in the background and a straight-on and side shot of the parade. Avoid the last parade if possible – it is the LAST event before the park closes at midnight. Once the parade ends, it’s a stampede to the car line. Try to catch an earlier parade before the kids fall asleep. Speaking of sleeping kids, WARNING – there are creepy looking men slamming shovels onto concrete. Not so pleasant for any sleeping kids (or some little awake ones for that matter). If you’re a Hocus Pocus fan, this is the show for you. 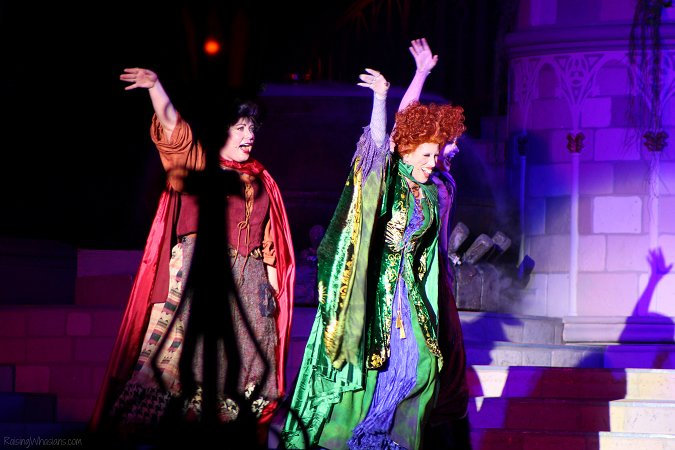 If you’re not a Hocus Pocus fan, you’ll definitely still get a kick of seeing your favorite Disney villains perform at the castle stage. Dancing, singing, and a fun spotlight on the most notorious villains, your family will love this show. Be warned, there are some popping fireworks noises! Scheduled show times for 2016: 8:00, 9:15, 10:40, 12:00. Must-see. There, I said it. This is one of the BEST Disney Fireworks Shows I’ve seen in awhile. Set to classic Disney villains music, the castle and the sky are lit up in very fun fireworks spectacular display. I love the Cruella fireworks (half red, half white) the best! 2016 show time: 10:15. Have a Not So Scary Good Time! Most importantly, don’t forget to grab those amazing photos and memories of your one-of-a-kind Disney experience! 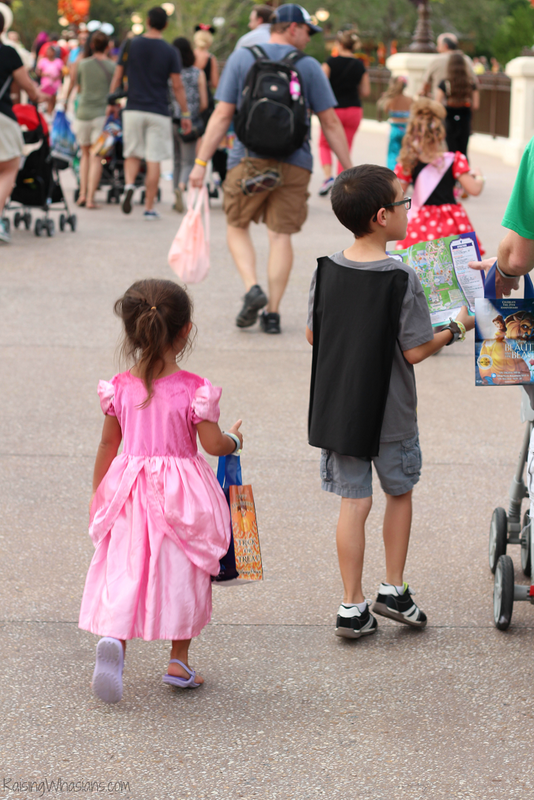 The Walt Disney World Mickey’s Not So Scary Halloween Party is a great alternative for little ones to enjoy Halloween without the being afraid. 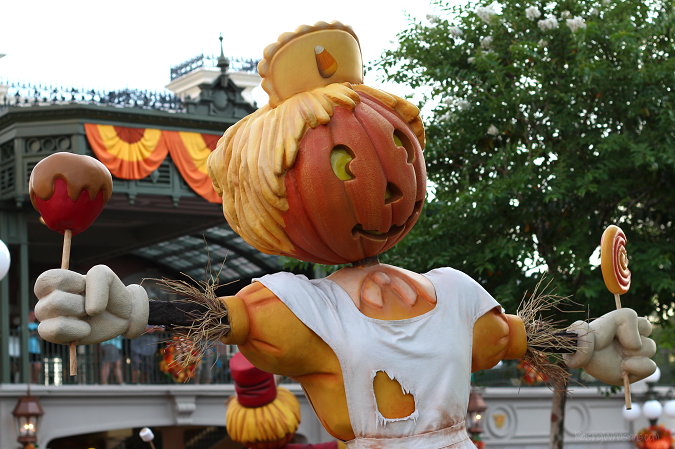 Mickey’s Not So Scary Halloween Party is going on right now on select nights between now at October 31, 2016. 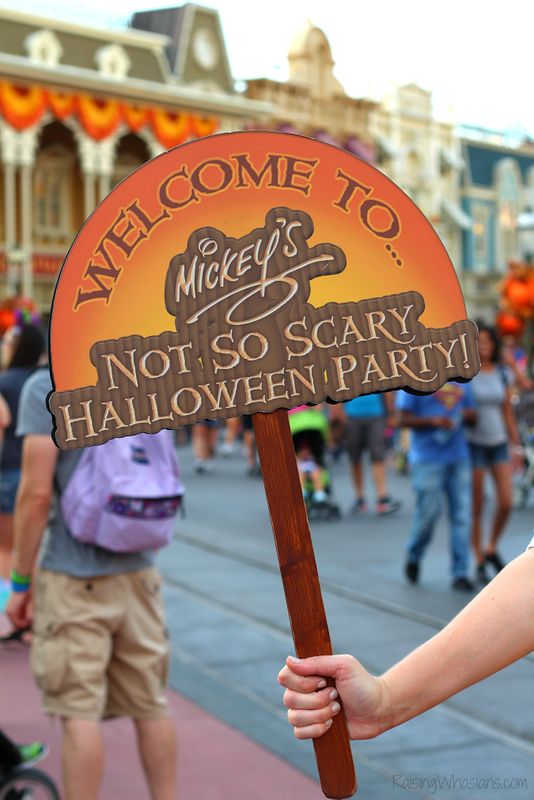 Grab more info on the 2016 Mickey’s Not So Scary Halloween Party. Be sure to follow along with the fun on social media with hashtag #NotSoScary. 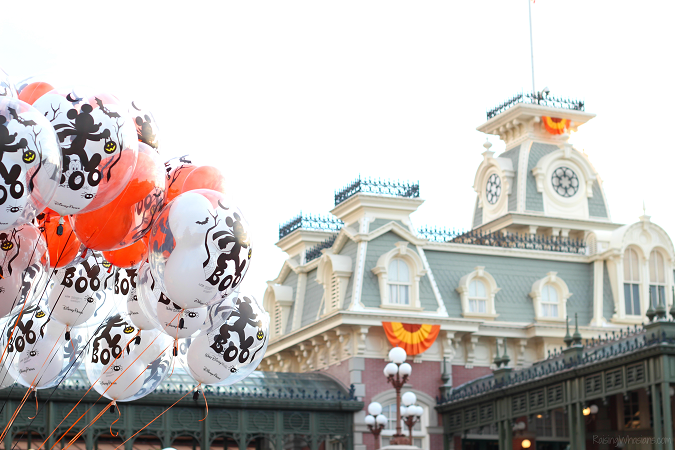 What’s your best family tips for Mickey’s Not So Scary Halloween Party? Great tips! 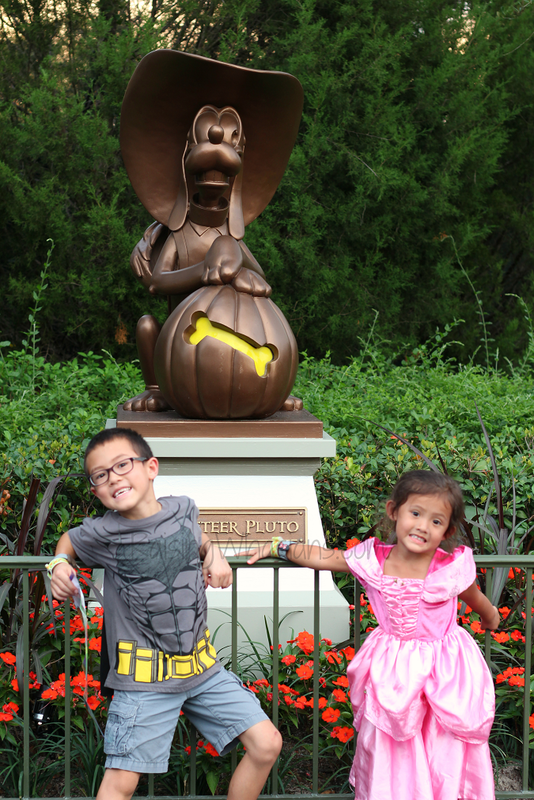 We just loved the Not So Scary Halloween at Disney! A wonderful family experience!